Thank you for your interest in our company. 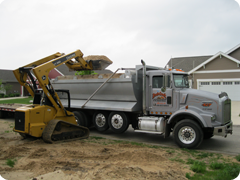 Rush Creek Excavating is a locally owned and operated excavating company based in Hudsonville, Michigan and serves the greater West Michigan area. For more information about our company, please read through our About Us page. Rush Creek was formed in May of 2000 with one goal in mind: To provide our customers with the best service and finished product in the industry. If you are interested in our projects and the services we provide, refer to our Services page. With a fleet of over a dozen pieces of equipment, we accommodate a wide range of construction projects. We are more than happy to answer any questions you may have and welcome any feedback you may have about our company, our work, or our web site. Please use the contact form to leave this input.